14 May Where Do You Have Your Home Office? Considering how much technology has influenced our lives over the last few decades, home offices can range from the interior of your car to even sitting in the washroom. Generally speaking, a home office is a great nook in your home where its tranquility and quietness allows you to get work done efficiently and still within the confines of your home. Where do you have your home office? A home office can be built just about anywhere in a home. Whether in the basement or tucked into a kitchen nook or even in a spare room now that the kids have left. We have found storage is paramount to keeping your office efficient. Despite what the younger generation says, most home offices have lots of books for reference. IF you have lots of reference books, or pocket books and school books, you therefore need somewhere to store them. Built-in bookcases are essential to storing your books and provide a space lower down to hide the possibility of filing cabinets. Lighting is key to your home office’s success. Whether it be task lighting or over all illumination, your need to see what you’re working on. Much is the same with your technology. Computers, tablets, phones etc all need an electrical power source. A hub for your electronic devices is a great way for you to keep in touch with everyone. One of the major considerations of your home office is the fact that this is where you hope to get some work done. It’s not for chitchatting or conversing with friends and family and a result, it should be private and quiet. 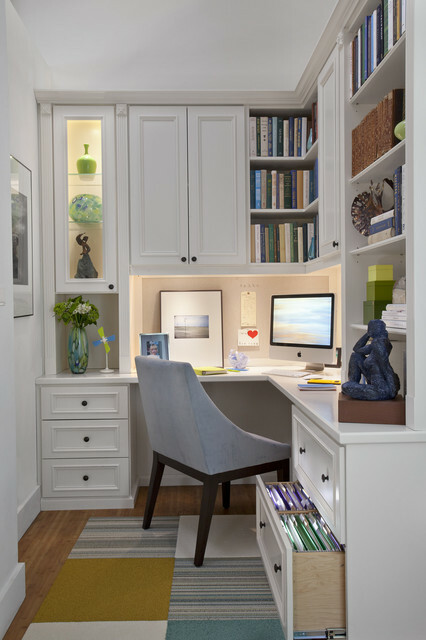 When you’re ready for your custom home office, send us an email or simply call us here at Space Age Closets and Custom Cabinetry.